The Council of Europe Youth Department in co-operation with the Ministry on Youth and Sport of the Republic of Azerbaijan is launching the call for participants for a National training-course on democratic citizenship and youth participation for specialists from public authorities working with young people and for representatives of youth non-governmental organisations from Azerbaijan. The training course will be held at the European Youth Centre Strasbourg (France) from 23 to 29 June 2018. The training-course will bring together civil servants and representatives of non-governmental organisations to discuss youth participation and youth policy developments, involvement of young people in decision making processes at regional and local level, a role of youth work and non-formal education in the youth policy implementation and how to improve the interaction of state structures, non-governmental organisations, and youth. The training course will be based on a Manual (“Have your Say!”) on the revised European charter on the participation of young people in local and regional life, that will be translated into Azerbaijani. 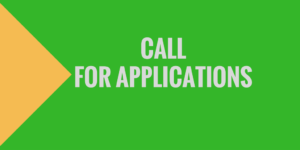 All interested candidates are invited to complete the on-line application form available at https://youthapplications.coe.int by 3 June 2018 and upload a support letter from their organisation / institution. The activity is a part of the youth dimension of the Council of Europe Action Plan for Azerbaijan.